By M. K. Van Rensselaer. Many writers have thought that Playing Cards were simply an evolution of Chess, and the features connecting them have been widely discussed, since there are strongly marked attributes common to both. But, as far as is known, Chess has never at any time been used for divination, and there are no traditions connecting it with prophesying, while from time immemorial cards have been used for fortune-telling by almost all nations, either through the complete pack of Tarots, or the Book of Thoth, their successors, the Playing Cards, or their predecessors, the divining arrows. On the other hand, Chess is distinctly a mimic battleground, with armies of warriors drawn in serried ranks, defying each other to mortal combat, whether there are only two armies, as in the modern games, or four, as on some of the Asiatic boards. The figures are the rank and file of the army, with their castles for base and retreat, their cavalry, their executive officers, and generals, with the monarch to preside over the field. That in Europe one of the figures is called a Queen is strangely out of place, for her actions and moves during the game are those of an active lieutenant or aide-de-camp. The name has been given to the piece in modern days, for originally and in the East it is called the Vizier. That the piece may be called after the dame who invented the game, as is said, seems improbable. Some writers declare that Chess came from Southern Africa, where it is well known; but it is also found in primitive form in Korea and throughout Eastern Asia, and traces of it have been seen in Central Asia, where (in Babylonia) stones have been discovered that are marked in squares, as if intended for Draught or Chess boards. In “India, China, and Japan,” by Bayard Taylor (page 108), the author says: “This palace of Sheesh Mahal (or Palace of Glass), with its courtyard paved with squares of black and white marble, has an open terrace in front, where is the throne of Akbar, which is a block of black marble about six feet square. It is said that when any one seats themselves on it, blood gushes from a split in the side, and red stains on the surface support this tradition. Opposite the throne is a smaller one of white marble, where the emperor’s fool sat and burlesqued his master.” This fellow carried a staff of office and conducted the pieces to their positions as indicated by Akbar and his opponent. The game of chess, with living pieces, became a favourite with the Rajahs of India, so many of the courts of different palaces were also arranged for Chess or Parchesi, a game played with pieces, but with less complicated rules than for Chess. Though the court jester was the master of ceremonies, he has not taken his place permanently among the chessmen, although he may be sometimes found among them, notably in a beautiful gold and silver set of men made for one of the kings of Bavaria and now in the Museum at Munich. In this set there are two Jokers, who are placed in front of all the others in the middle of the board as at present arranged, but their value and moves seem not to have been recorded and are now practically unknown. It was at one time supposed that the figures of the chessmen were transferred to pasteboard cards, thus making a masked army instead of one that was on an open field, and that Playing Cards originated in this way; but this theory is no longer tenable. Mr. Wiltshire, in “Playing Cards,” derides the idea that they are derived from Chess, saying: “Chess is a game of calculation and combination, and cards are purely chance,” which opinion is sustained, for up to this time the history of the two games points to no common derivation. It is claimed that Chess was first played before the walls of Troy, having been invented by Palamedes to amuse the Greeks, who were tired of the monotony of the siege. This is probably one of the first records of games, although it is not certain that the one referred to was Chess any more than that it was a game of cards, which some writers have supposed. In “The Sea Kings of Crete,” by Rev. James Baikie, is an account and an illustration of a gaming board just discovered in the palace of Minos, which certainly dates from one thousand four hundred years before Christ, but it resembles a Draught board more than one for Chess. There is an Egyptian caricature of a lion and a unicorn playing a game on a table with men, which, however, are too indistinct to describe as chessmen. There is a set of chessmen in the British Museum, the date of which is uncertain, that are by some considered to have been of such early origin that they prove that the Egyptians had the game, although deductions of this kind are sometimes overthrown by subsequent discoveries. That chessmen of the conventional type are by no means absolutely necessary for a game is shown by the Korean Tjyang-Keui, whose figures closely resemble the pieces used by the Chinese. The men of the set in the writer’s collection are of wood about the thickness of an ordinary checker or draughtsman, but they are octagonal in shape, and the size of the pieces varies, since it is indicative of the value. Sometimes the pieces are circular in shape, and have their value painted in incised characters on both sides in red, blue, or green, according to the side they represent. The King or General is much the largest piece and about an inch and a half in diameter. The Chariot, Elephant, Horse, and Cannon are of medium size, while the Pawns and Councillors are the smallest. The pieces in the writer’s collection were kept by the original owner in a netted string bag. The board differs from those of Europe, as the men are placed at the intersections of the squares, and not in their centres, as is customary in other places. The game, as played in Korea, is logical, and was the inspiration of various games played in Germany, where marbles are placed in stated positions on boards made for the purpose, with rounded holes, and marked off with diagrams. In some games the board represents a fort to be defended; in others, a series of positions to be captured by one or other of two armies of equal value. A very interesting set of chessmen in the British Museum was found at Nig, in the Isle of Lewis, and is described as “North European, Twelfth Century.” The backs are carved with intricate interlacing designs like those on the reverse of the old Tarots. The Queens rest their cheeks on their right hands. The Kings have swords laid across their laps. The Bishops are mitred, and all are seated. The Persians claim that Chess was invented in their country, pointing out the retention of some of their names and expressions in the English game, such as “Check,” from the Persian Sciack or King, and “Mat,” signifying “dead,” hence “Checkmate,” or “The King is dead.” These words may well have their derivation from the Persian or Arabic, but they are not universally employed, although Chess is of ancient origin and has been played for centuries in Africa, Asia, and Europe. The term Rook, that is sometimes used instead of Castle, is undoubtedly of Indian origin, derived from Rokh, and signifying dromedary. In China this piece is called Ku, and in Korea Tcha, words in no way connected with the Arabic. There are many historical descriptions of Chess in Europe too well known to be repeated; besides which, there are numerous copper, steel, and wood engravings showing persons playing Chess. In “A History of the Moorish Kings” (1396), there is an account of a game played when Jussef, the heir to the throne, was ordered to be beheaded by his usurping brother. An alcade was sent to the prison for the purpose of carrying out the command, but, finding Jussef playing Chess, and becoming interested in his skill, he waited until the game terminated to dispatch the prince. However, before it was finished, the usurper, Mehemed, was murdered, so Jussef succeeded to the throne and rewarded the kindly executioner with money and honours. One of the earliest descriptions of Chess in the English language was written by Thomas Hyde in 1694, at about the time that Cotton’s “Complete Gamester,” on the subject of gambling and its tools, appeared. There is a rare book, entitled “The Game and Playes of the Chess,” that, strange to say, contains little or nothing concerning the game beyond its title. “It is remarkable,” says Sir Gardiner Wilkinson, in “Ancient Egyptians” (Vol. II, page 415), “that a game so common as Mora among the lower order of Italians should be found to have existed in Egypt from the earliest period of which their paintings remain, even in the reign of the First Osirtasen.” The game, which requires no accessories, is skillfully played by holding up certain fingers to an opponent, who tries to guess the number; it was probably carried to the Southern ports of Italy by the Egyptians, when the yearly voyage was made to the Bay of Naples, at the time that the great Temple of the Serapeon was erected at Pozzuoli and the cult of Thoth Hermes introduced. An anonymous writer in an English paper states that one of the frescoes of the palace of Rameses II shows the mighty Pharaoh himself playing against some of the beauties of his harem. Many writers consider that the Roman Latronculi and the Greek Digrammisnios were games of Chess or Draughts. A Spaniard, named Antonio Torquemada, published rules for the latter as early as 1547, and a Frenchman, named Pierre Malet, described the Parisian game in 1668. The latter called for a board of sixty-four squares, the men moving but one block at a time, and the crowned pieces having the right to move backwards. The game was not popular in France until the days of the Regency, when the Polish game, that is played on a board with one hundred squares, each player having twenty pieces, became the vogue. This variation of the old game of Draughts was introduced by a man named Manoury, who started life as a waiter in one of the cafés. He gave lessons to Marshal Saxe and Jean Jacques Rousseau, besides writing out the rules governing the game for the use of his pupils. In France and England players use the black squares on the Checker board, but in Holland and Russia the white ones are those that are favoured, and it is strange how puzzling this slight change is to unaccustomed players. Draughtsmen or checkers are made of many different materials, such as clay, bone, wood, and ivory. Some old ones in the British Museum are of ivory, two inches in diameter, and were found in Leicestershire. On one of them is a figure like Il Pendu, or the Hanged Man, of the Atouts. In the writer’s collection there are some draughtsmen of unpainted wood most beautifully carved. One of them displays a winged figure with a cap of Mercury hanging over his head, on top of which is perched a die, a Four Spot on one side of it, while the other displays an Ace. The cap is suspended in the air over a table covered with a fringed cloth, on which rests a rose and a laurel wreath. A motto surrounding the checker reads: Fert Praemia Favsta. On the reverse is a hand emptying a purse on a Backgammon board, the legend being Freqvens Tibidissipat Avrum. Another checker, a mate to the above, shows a table on which is a Backgammon board and two players busy over the game. The man is seated, while the woman is standing with arms upraised, and having evidently just lost a game, is upbraiding her companion. The motto is Ars Sortem Corrigat Astx. The reverse shows a draped Cupid opening a money chest, the motto being Sat Loevlo Havt Ocvio. A black man of this set shows a warrior talking to a harpist, the motto being Juam Rari Amici Chari. The reverse shows a figure of Mercury, as Luck, with a philosopher and a courtier trying to hold the flying figure with ropes that have been thrown around the waist of the flitting god. The motto is Ah Fortuna Bona Me Condona. These checkers are part of a set that was once in Lady Charlotte Schriber’s collection of games. They are probably of German manufacture, as they closely resemble sets of draughtsmen that are in the Nuremburg and Munich collections. In Korea the game of Draughts is a favourite one. The pieces are not flat and round, like those of Europe, but the “horses,” as they are named in Korea, have shanks about two inches long, with round, solid bases, making them easy to pick up and move, but they would be awkward if the game called for “jumping,” as does that of European players. With this exception, the rules for playing resemble those common in Europe. The Japanese, the Siamese, and the Chinese all play the game with the assistance of dice, and the men as well as the boards show an origin common with those already mentioned. They are games of luck or chance, but are not used for fortune-telling, and have nothing in common with cards, arrow divination, or prophesying, unless students can hereafter trace them to the Urim and Thummim of the Bible. Games with dice are favourites in all Asiatic countries, but the men themselves and the games played with them are far more elaborate and scientific than those of Europe, and capable of a great variety of combinations quite unknown to English-speaking nations. The mathematical calculations necessary for the Asiatic games are intricate and complicated, but well worthy of adoption. About 1815 the Germans issued a pack of cards that had dice on them instead of the commonplace pips. The set in the writer’s collection is incomplete and incomprehensible without the rules, that have been lost. 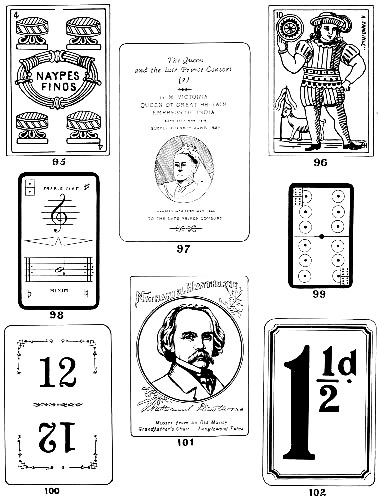 The cards have the dice on the lower half, while the upper part displays different designs, such as a diligence, a ship, a bookcase, and an easy chair. The two designs last mentioned have “doctor” printed under them. Games of dice are probably the oldest known, and are found in all Asiatic countries. The evolution from them to dominos is easily traced, for the latter is evidently a pair of dice placed together. The pieces in a Korean set of dominos in the writer’s collection are of the size that a pair of European dice would make if glued side by side. Besides the games of chance, dice are used for divining purposes all over the world, but particularly in Africa and Asia. Jackstones, or Knuckle-bones, is another old game. There is in the British Museum a most interesting marble group of boys playing Jackstones. A lively dispute, if not an active fight, over the result of the game is in progress, and the little men are scattered over the ground while the boys wrestle. Jackstones may be of many different materials, although those most commonly used are the simple round pebbles found by any roadside. A set in the writer’s collection is of bone, which was common in New York about 1850. Others are of glass and are said to be Phœnician. Ivory and sheeps’ knuckles are favourites with children, who in modern times have added a small rubber ball for a Jack. The game seems to be universal, for children on the Nile, in Hungary, Austria, France, England, and the United States all seem to play the same primitive game that is common in Asia. In “Korean Games” (page 58), Mr. Culin calls it Kong-Keui, and says it is played by boys with five or six stones or pieces of bricks. When girls play, they use cash or coins, and then the game is called Tja-Ssei. When played with stones, it is called Ishi-Nago, or throwing stones, and ten of these are used. The Chinese call the game Chaptsz, or picking up stones. No rules for the Western game seem ever to have been written, but they are transmitted from one generation to another with almost no difference, whatever the country may be, although it is noticeable that the innovation of the rubber ball for a Jack seems to have been introduced by the Polish or Russian Jew children to the New Yorkers, as it is chiefly played by these little immigrants. The game has nothing to do with divination, and is one merely of skill, as it is a simple amusement of the most primitive kind, for, given a handful of stones, any one can learn the game, and, with a moderate amount of practice, can play it with more or less skill. There are five pieces to a set; four are of equal value, and the fifth is called the Jack. Any one of the five may be used for the Jack, which is simply the stone that is tossed into the air while the others are gathered in the hand. The sets (or their order) are agreed upon beforehand by the players. Any number can take part, for each one plays for himself, and the winner is the one who independently executes all the difficult sets without failing. Any place is convenient for the game, and the stones are generally thrown on the lap, the ground, a pillow, a doorstep, or even the pavement. “Muggins” is the name of the first set, which consists in gathering all five stones in the palm of the right hand and throwing them into the air together, then catching all five on the back of the hand. Without stopping, the stones must be thrown again in the air and all five caught together in the hand. This makes all the stones of equal value and all of them Jacks (the technical name for the stone thrown in the air while different movements are being done). The Muggins set requires considerable dexterity, and a player dropping any one of the stones loses his turn, which passes to the player on the left. The next set is not started until all the players have successfully accomplished their turn of Muggins, which must be done five times in succession without failing. “Milking the Cow” is the name of the second set. The stones are gathered in the hand and the Jack is thrown into the air, and while it is “up,” one stone is quietly and gently placed upon the table from the palm, but must not be thrown or dropped, and the Jack caught as it comes down. This is repeated until all the stones are discarded one after the other, the art being to do this without letting more than one escape at a time. If this is not done, the turn passes to the next player on the left; but, if successfully accomplished, the stones are swept into a heap and caught up in the hand while the Jack is in the air. All the players must do this in succession or lose their turn. Those who have not completed the first Muggins take their turn here, and must do it five times without fault before beginning to milk. “Grab” is the name of the third set, and it is difficult. It is called “Laying Eggs” in Korea. It is done by laying four stones about two inches apart in a row, tossing the Jack and picking them up one by one. The first stone is kept in the hollow of the palm of the right hand while the Jack is tossed and the second stone is picked up. This is retained, and the third stone is picked up in the same way, and so on until all are caught in the right hand. Then all are placed in a heap and are gathered while the Jack is tossed. The left hand is not used at all in these two sets. “Peas in the Pot” is the first set of the second part of the game. The left hand is partly closed and four stones are placed about an inch apart in a row, the first one touching the thumb. Players, to show their skill, will often make the spaces wider, but they must not throw the Jack any higher than is usual, which is about a foot and a half. The play consists in throwing the Jack, and, while it is in the air, one stone after another is picked up and put in the pot (which is the left hand). Some players push the stones into the pot. To do so, the thumb and forefinger of the left hand are opened to allow the stones to pass in, but this is considered unworkmanlike by good players. The stones, after being placed in the pot and the left hand removed, are gathered with one swoop as the Jack is tossed. “Horses in the Stable” is played with the fingers of the left hand outstretched to form stalls. The stones are placed about four inches away on the table, and must be pushed into the stalls one by one while the Jack is aloft. Then all are gathered up at once in the right hand while the Jack is tossed. In Hindustan the native girls have their photographs taken when playing this set of Jackstones. “Horses out of the Stable” follows. The stones are pushed out with one motion, one beside the other, and then caught up with one sweep as the Jack is tossed. The art consists in getting the stones close together when they leave the stalls, so that they can be grabbed with one sweep while the Jack is up. “Sweeping the Floor” comes next. The stones are placed four inches apart in a square, and the third finger of the right hand must sweep inside two of the stones without touching them while the Jack is aloft. They must then be gathered and caught with one sweep of the hand. “Spreading the Table” is done by arranging the square with four stones, as in the preceding set, after which they are pushed together with one sweep and caught in the right hand while the Jack is up. “Laying Eggs,” called Al-Nat-Ki in Korea, is the next set. American children play it exactly in the same way as do the Asiatics. Four stones are placed on the table, the Jack is tossed, one stone is picked up and laid down while the Jack is in the air. Then another stone is picked up as the Jack is tossed and laid down as before, until all are used. In “Korean Games,” Mr. Culin describes this play, but no reference is made to the preceding sets, although they are played in Europe. “Hatching the Eggs,” or Al-Kka-Ki, consists in holding all the stones in the right hand, with one tucked under the little finger. This is then dropped gently on the table while the Jack is tossed, the other stones being held in the hand, and this is repeated until all are down. A good player may work right through the whole number of sets before the opponents have a chance to play at all. Children often arrange handicaps among themselves to prevent this. One peculiarity of the game seems to be that it is a point of honour among the children to take no unfair advantage of each other, but to try to assist and make the others win if possible, and it is one of the few games played by children that seldom lead to quarrelling. There are variations of the sets, but the above is the standard game. Quite different from the last, which is simply one of skill, is the game known as Jackstraws, which is a primitive game, but it is played all over the world, and is evidently derived from the “arrows of divination.” A set of Chinese Jackstraws in the writer’s collection was made about the middle of the last century, probably for exportation, for some of the straws are European in character. They are of ivory, which is most delicately carved, and are not coloured, as are some of the sets of Chinese Jackstraws that are carved out of bone. They were imported by a naval officer who was on the expedition under Commodore Perry which opened the treaty ports of Japan to American trade. In this set there are two hooks, for separating the pieces one after another without shaking any of the bunch. The long, slender “straws” are four inches in length. There are eight that are carved to represent Javelins, and eight carved like Spears. They count, respectively, one and two marks if taken from the rest of the pile without shaking. Then there are twenty Straws, counting ten apiece, that are delicately carved, each one entirely different from any of the others. There is a Spade, a hooked Spear, an Arrow, an Axe, a Flag, a Standard, a Halberd, a war Hammer, a Javelin, a Sabre, a Lance, a Sword, a Trident, and a Pitchfork. These all seem to be intended to represent weapons familiar in the antiquated warfare of China. The five European implements are a long-handled Shovel, a pair of Tongs, a Bodkin, a Pen, and a Musket. The skillful player who captures the Tongs counts twenty, since it is twice as difficult to disentangle as any of the other Straws, that are valued at ten marks apiece. This is taken from Prophetical, Educational and Playing Cards. See also: Concerning the Origin of Chess, by H. E. Bird.